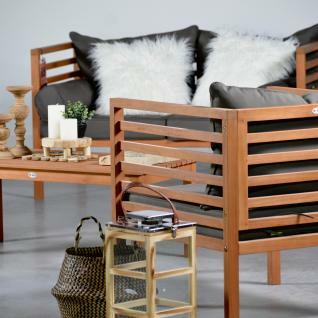 The Cordoba set is a chic 4 seater garden sofa set. 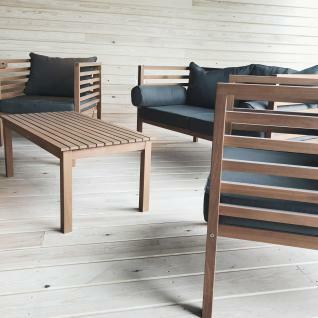 Its modern look is complemented by plush seat cushions that are 10cm thick, making the set extremely comfortable. 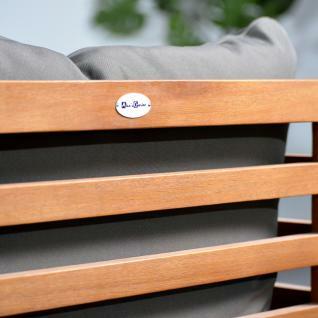 The back cushions are 20cm thick and the sofa comes with 2 round pillows to provide extra support and comfort. All these cushions are finished with piped-edges giving them that high-quality finish and feel. The Cordoba is robust and durable as Eucalyptus is a hardwood. With weather conditions in mind, we have chosen to get our wood from FSC certified plantations in Uruguay, where sustainable forestry is practised. The wood is covered with a colourless protective oil. 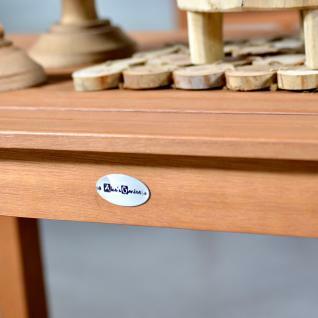 The oil protects the wood from the elements and gives it an enriched colour finish. This sofa set is covered in a colourless oil during the production process. There may be some residue left on the wood that you should remove with a cloth before use. 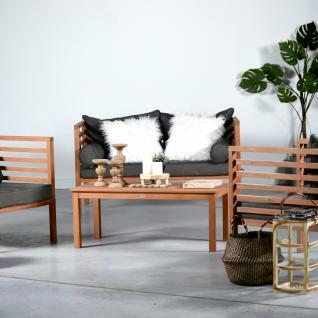 There’s no need to put more oil on your new sofa set, you can wait until the end of summer. Eucalyptus is a living material, therefore it’s appearance changes over time and some small cracks may appear. This is completely normal and it’s what gives this hardwood it’s authentic charm. The Cordoba is robust and resistant against bad weather, you can add a little TLC to prolong its life. On a daily basis, remove leaves, stagnant water, dirt and dust. Clean blemishes and any residue with a sponge and soapy water. If your table needs a deeper clean you may use a hard brush. In springtime and the end of summer, clean your garden sofa set and leave it to dry. Once the wood is completely dry, apply a fine coat of oil. Be sure to check that it is not due to rain for 24 hours after applying the oil. If your Eucalyptus sofa set was exposed to harsh weather, you may note that some of the superficial fibres have swollen slightly, and have become rough to the touch. To rectify this, you can lightly sand the affected area with the grain until the wood has regained a smoother look and feel. Once you’ve finished sanding the wood, apply a layer of oil to get the sofa set back to its original colour. 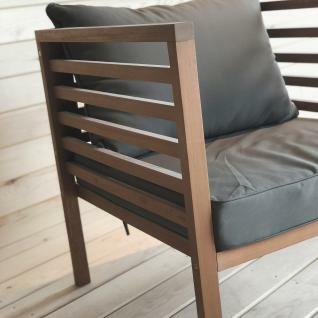 The layer of oil is what protects the garden furniture from developing patches, and shields it from pollution, bad weather and moisture. If you choose to age your eucalyptus furniture, by not applying oil once a year, it will become a lovely silver colour. However, it won’t be protected from the elements anymore..
-It’s important to store your eucalyptus furniture during winter months. Store it in a cool, dry place, free from humidity. If you would like to cover the set for protection, we recommend Polyester rather than PVC. -Keep your set away from direct, or strong, heat sources. -Don’t leave a wet sponge on the table top, this will make the top rough to the touch.